I had been thinking about black beans for weeks. I wanted to cook a big pot of them and then use them in a couple of different dishes. Mostly, I was thinking about making black bean soup. In the process of searching here and there to compare and contrast different soup recipes, I discovered this gem of a starter in Rick Bayless’ Mexico One Plate at a Time . 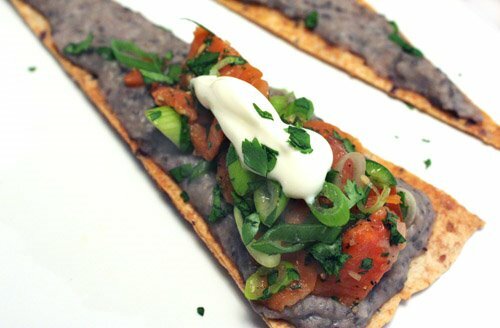 Crisp, slender-cut tostadas smeared with pureed black beans and topped with a fresh mix of smoked salmon, tomato, green onion, serranos, and cilantro grabbed my attention, and I went right off to collect the ingredients. To make the black bean puree, avocado leaf is suggested as an optional ingredient. If you’re lucky enough to have some, you are to crumble a leaf and add it to the food processor with the beans. I read a recent blog post on Oyster Food and Culture about avocado leaves and hoped I’d be able to locate some for this recipe. In fact, I left the house feeling sure I’d find avocado leaves. I was wrong. Once again, a hunt for a specific ingredient was unsuccessful. One day, I’m going to open my own little specialty shop for all of these ingredients that I never seem to find. At any rate, the avocado leaf was optional, so I proceeded without it. Onion and garlic were sauteed and then added to the food processor bowl with the black beans. It was processed until smooth and then returned to a saute pan. Bean cooking liquid was stirred into the puree a little at a time until a a soft consistency was achieved. That was kept warm while the salmon mixture was made and the tortillas were cut into long triangles. The instructions suggest frying the tortillas, but I brushed them with oil and baked them instead. Then, the tostaditas were assembled and topped with some crema. The smoked salmon mixture was ceviche-ish although there was no lime. The smoky saltiness of the salmon with the crunchy green onions and chiles contrasted nicely with the smooth bean puree. These tostaditas would be great for a party as a small amount of smoked salmon was stretched to serve several portions. Also, by cutting the tortillas yourself, whether you fry or bake them, you can decide the size and shape for ease of serving. This was another winner of a dish from Bayless, and I haven’t encountered a disappointment from this book yet. YESSSSSSS! That looks like something I can dig into! I love every component of that recipe! I love Rick Bayless too, I have never been anything less than thrilled by anything I make from his recipes. In fact, most of the time, I am in awe.. "I made that?, wow - sweet!!" Thanks for the mention, but like you I am shocked you could not find avocado leaves in Texas, what is the world coming too. I'll do a bit more exploration and see if I can find some good US sources, and will let you know. Smoked salmon, blackbeans, seems like a recipe for success if you ask me. Be still my heart. This is incredible. I could eat all of this and that's no lie. I am bookmarking this to make this weekend! Wow, your pictures look great Lisa! I love Rick Bayless, if I'm flipping channels and that show is on I ALWAYS watch it! Thanks for sharing such a great recipe! I have yet to eat at one of his restaurants, but this looks good! That blackbean look so mouth watering Lisa. I wish I live next door to your place, I can just hop and steal one of this from your kitchen, ha...ha..
Those tostaditas look good. If you didn't mention that you made them, I really would have though that they were from a fancy restaurant. The presentation of them is rally nice. Love the addition of black beans! I somehow have not acquired a taste for "smoked" food(I know,I know-must sound VERY strange)and God knows I've tried to,but.........Maybe one day..
You have SOOOO got my number with this one. I've been on a Mexican cooking spree lately, probably because a) it's so hot out and b) I have a ton of cilantro in the garden. I made my own version of black bean tacos -- and of course used the leftover beans for the cookies. Embarrassing but true: I've got two Bayless books and never actually used them. Might be time to change that. I love that kind of food! Your tostaditas look scrumptious! Great presentation. They look so delicious! Wow, this is so different from the food I typically make, but I'm going to try this for guests. Looks great and healthy too. lisa you did an outstanding job with this one - simple things kicked up to stellar levels....nice! Mmmmm black beans! They are a staple. Seriously. mmmm,I could eat this everyday! these look incredible! I have to try sometime. would make wonderful bite sizes for outdoor parties. Gorgeous picture! And it sounds like a great little crunchy snack without the guilt - perfect! These are like sophisticated nachos. I love black beans and I crave them after looking at these gorgeous photos. These tostaditas look great! 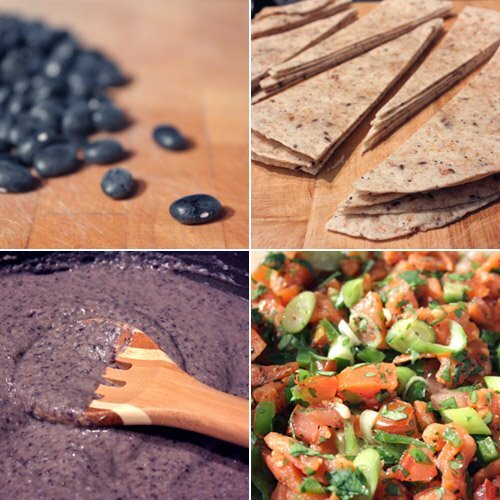 Smoked salmon and black beans sound like a wonderful combo! The combo sounds amazing. I've never heard of tostaditas before but this makes great tapas for parties. vat a great idea! these tostaditas sound addictive.. yummmm!! MMM, that looks really good. It's making me very hungry. Very original combination! These tostaditas look delicious! Love them. This in one hand and a scratch magarita for the other on sunny day. I might try this with an actual halibut ceviche instead of salmon. I eat so much smoked salmon that I get tired of it. Going fishing this weekend to fill up the freezer. When you open up that store, please do it in DC (it's not Texas, but we are *technically* in the South :-P). I HATE the ingredient treasure hunt so much. Depending on the menu, sometimes we have to go to 2 grocery stores, a butcher, and possibly a specialty shop for a week's worth of meals. Did this call for cold smoked or hot smoked salmon? I could see either being good here, but would probably go with Lox myself. Nick: the recipe didn't specify about cold or hot smoked salmon, and I just went with cold. Either would be great. As climbhighak mentioned, a standard ceviche would be great too, but you might want to drain off the lime juice when you scoop it onto the bean puree. I was thinking chopped, grilled shrimp would be a contender for this, and, of course, leaving out the fish and making it vegetarian with just a little chipotle would also be fantastic. Pairing black bean and smoked salmon sounds excellent! I like the colorful result! Beautiful! What perfect party food! Just throw in a pitcher of margaritas, and you're set. This looks so yummy. It's not easy to get the proper black beans here in Switzerland. I have to check out with my American friends where to buy them here. I just found black beans for the first time since I moved to France (to Janet... I got them in the Mexican part of the international section of my grocery store... dried only) and the first thing I did was make a big pot of black bean soup. 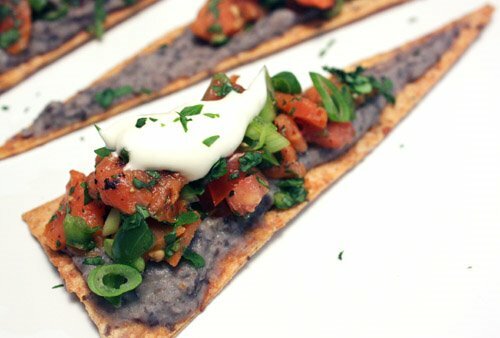 These look awesome though... and I love the almost purple color of the black bean purée... very pretty! what a pretty dish! I love salmon!!! Those look really good! Nice presentation! This looks delicious. I could snack on these all night! Such a fresh colorful dish! Gorgeous and something I'd love to make for my future housewarming party! Great combo of flavors! These look out of this world! I bet they were just delicious. I could eat an entire platter of these! Beautiful. Wow, that looks like such a tasty bite. I could pack in quite a few of those babies.